It's been a while that i was waiting for an opportunity to create my own animal collection of charms, ever since i saw felt and fabric folks do it, I wanted to make some from polymer clay. A week ago I got a phone call from a lady, she is a director in one of the collages here in Israel, theater department. The lady asked me if I can create animal keychains, she said that they are doing a play called "Animal Farm" based on a novel by George Orwell, each actor will receive a special gift at the "finale'" of the play featuring his own character. Exactly what I was waiting for. 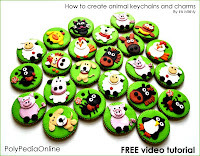 You can see how 4 of them were made in 2 videos - The pig, the sheep, the horse and the chicken. It's really all about working with cookie cutters and creating a flat, 2D design, playing with colors, shapes and having fun. 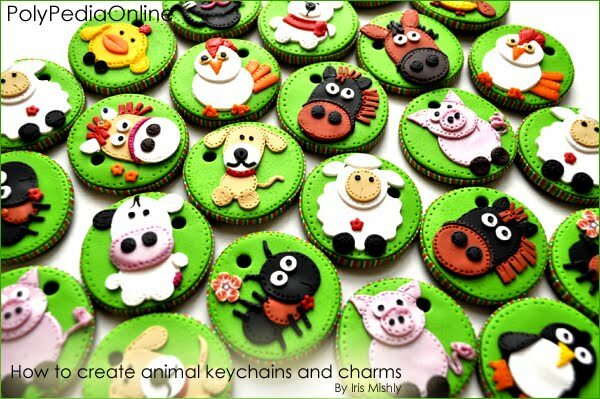 Your Animal Charms are wonderful Iris!!! I love them all, such great detail... Fun and whimsical! Thank you Trina! :) I had real fun making them! Tineke said:They are super cute, thanks Iris for showing this. Becoming an "ELITE Caner" - 24 Hours Left!